The two generations of Thunderbolt technology are compatible with each other. The ports and cables are identical. 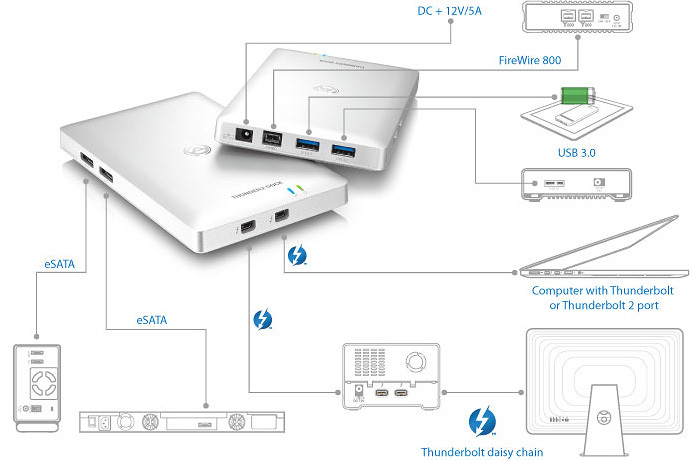 The device has to be connected to the computer via Thunderbolt interface. This docking station does not have any internal storage. All data is stored on external drives that are connected to the dock. In order to recharge an iOS device over USB (e.g. 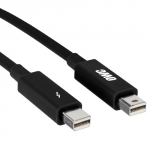 iPhone, iPad or iPad mini), the Thunderbolt cable has to be connected to the computer and the system has to be running (S0 or S3). The OS has to be updated to Mac OS 10.9.2 or above and a driverhas to be installed. The maximum transfer rate for each eSATA port and for the USB interface is about 370MB/s.